A Couple in the Kitchen: Happy Halloween/Foodie Penpals! Happy Halloween, everyone! There is a nice chill in the air that is just right for trick-or-treating. As we are child-free, however, we will have our traditional Halloween night festivities - carving jack-o-lanterns, eating take out, answering the door over and over again, oohing and aahing at all the costumed kids, and roasting pumpkin seeds. Then, perhaps, after the treats have been given out, we'll stop at a neighbor's house (or two) for "trick or shot." Or maybe not. It is a school night, after all. In addition to all the Halloween fun, This is our first month participating in Foodie Penpals. ﻿Are you wondering, "What is Foodie Penpals?" Because you ought to be. 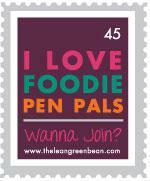 Foodie Penpals is a program started by blogger Lindsay of The Lean Green Bean. Over 1,300 participants from the US, Canada, and the UK receive a different penpal each month, and send them a box of foodie goodies. Even though we just joined, we are already hooked. Our sender pal was Jacqueline of Run With Chocolate. She sent us an amazing box filled with her local (California) and all-around favorites. Take a look! Flavored California almonds (butter toffee and "fruit-loop" flavored - sweet and addicting!). Unreal/Unjunked Chocolate Caramel Peanut Nougat Bar (loved it...wish we could find them here) and a KIND Fruit and Nut Bar in Almond Coconut (almonds and coconuts...two of Amy's faves). Creamy Sunbutter (a fabulous nut-free spread made from sunflower seeds) that combined so nicely with the Marmaletta Peach Pie Preserves for a unique twist on pb-n-j (and a fine school lunch). And, Amy's particular favorites from the box, which she enjoyed the day after Hurricane Sandy during an unexpected day off of work: English Breakfast Tea, Tea Honey and a hand-made tea cozy (to keep Amy-the-Tea-Fanatic's fingers from burning), with Daelman's Jumbo Caramel Wafers (which Amy ate as Jacqueline suggested - warmed by the steam of that wonderful tea). Note how the papers that need grading are strategically hidden beneath that tempting Food Network Magazine! What a nice welcome into the Foodie Penpal community! Thank you so much, Jacqueline! If you want to read about what we sent to our Foodie Penpal, check out her blog right here.﻿ To learn more about the Foodie Penpal Program, go here. I participated for the first time this month. It was really fun receiving my pen pal's package. Looks like you received a terrific package of goodies.